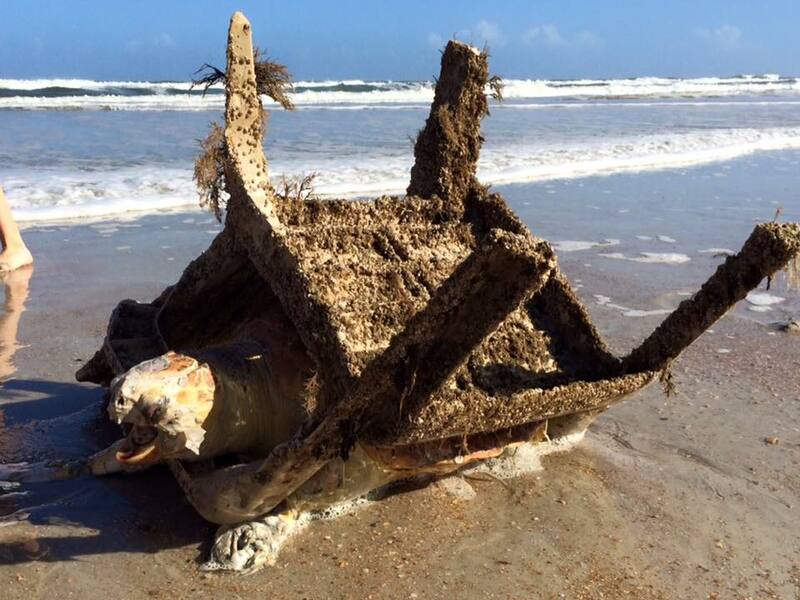 A sea turtle at Mickler Beach took its last breaths caught in a plastic lawn chair. According to National Geographic, EIGHT MILLION TONS of plastic are dumped into the ocean each year Seriously? It sounds like just a stat and it is, but this picture of a sea turtle caught in a plastic chair brings it home in a real way. I took this picture with my boys this Thanksgiving at Mickler’s beach access point in Ponte Vedra Beach, FL. This poor, huge sea turtle got stuck in a plastic lawn chair for who knows how long. By the looks of its badly damaged body it was a long while. Those that saw it get washed up to shore say it took its last couple of breaths once it landed. STOP throwing away your plastic. Avoid purchasing it in the first place. Eliminate use of plastic bags and bottles. I wish the U.S. would get on board with taxing our stupid use of plastics. Money talks. Too bad the sea turtles can’t.